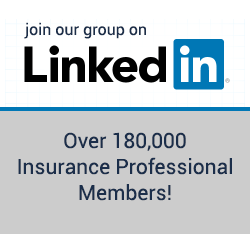 Welcome to the premier insurance forum on the Internet. This forum is intended to provide a place for insurance agents and professionals in related fields to communicate openly about marketing, products, commissions, as well as the business practices and sales tools that can aide in business success. Please take a moment to read the tips and rules for making your time on the forum the most beneficial experience for you. Before registering, please be aware that we do not allow promotional posts or spamming activity within this forum community. Any posts viewed as promotional in nature will be immediately deleted and your account may be banned. Furthermore, if you are joining to post an offer to agents, or promote a website or business, we will consider it as spam and delete the posting. Sending unsolicited private messages for the purpose of promoting a product or service, as well as offering a contract or any other commercial unsolicited post is also considered spam and will result in a lifetime ban. And, any member promoting a company and not disclosing their affiliation with that company will be banned. If any of your first posts violates these rules, you will be immediately banned. For further clarification on our policies, please review here. The forum discussions are a great way to share information with other insurance agents and professionals, as well as discovering tips and ideas for getting started in selling insurance and hearing about best practices and success stories for improving your book of business. We encourage you to participate in forum discussions as it not only connects you, but helps grow the body of knowledge available on the forum. As a member, you are able to start threads and post within existing discussions immediately. The only exception to this is within the Insurance Offers Forum, where you will need to have had 100 posts before participating in this discussion. If you would like to promote your products or services, there are two simple ways to do it – advertise on the forum or contribute via posts. Place your links in your signature and post contributory and beneficial information not related to your business. Both ways are powerful methods for attracting attention to your offerings. For more information on advertising, please review our media kit. Members are able to have links in their signature, as well as in their posts. This additional member benefit happens after members have contributed 20 useful posts. The required number of posts, however, is subject to change without notice, as the forum administration sees fit. Users may also post links to other websites and resources within their posts, so search engines can give credit to the links. No posts will be allowed, however, to affiliate, referral or other incentive type offers that are meant for personal gain. Please do not abuse this or we will be forced to disable your signature and may even terminate your account. If you wish to draw attention to an article from another site, please provide a link and one or two sentences. Please do not post the entire article, as it is almost always a copyright violation. All posts made on this forum are the work product of the poster. When posting on this site, you give Insurance-Forums.com exclusive rights to display your content and waive all rights to control how the content is used. The forum may edit or delete posts at the discretion of forum management. Posters will not be allowed to request that all their posts are deleted if they leave or are removed from this site. Posting on this forum constitutes explicit agreement with this rule. Joining this forum and posting constitutes agreement that mass deleting all posts from a poster can negatively impact the flow of the forum discussion and will not be allowed. It is much easier to learn and extract, or give value to the forum through positive interactions between members. We reserve the right to terminate anyone's account if they are only providing negative comments. Use the search function. Many topics will have already been discussed many times. You should always search the forum first before starting new threads. We maintain the right to delete posts and terminate accounts at will. In general we have a very liberal posting policy and rarely ban anyone for anything other than spam. However, the management has the final say and reserves this right. It is against our terms of service for anyone to join the forum with multiple accounts. Failure to comply with this rule will absolve the forum from any responsibilities with regard to keeping user information private. We forbid all vulgarity. Curse words will be deleted and the violator will be subject to suspension. There are many colorful ways of expressing your thoughts without resorting to vulgarity. The Forum takes a fairly liberal policy on allowed posts and rarely bans members for anything other than spamming. Sharp political discourse, criticism of the forum administration, criticism of our sponsors and advertisers are all examples of things that are allowed and members will not be banned for. However, the forum is a privately owned and operated website and we do reserve the right to ban members at any time for any reason, including the sending of private emails to forum administrators that are deemed to be disturbing, offensive, or contain threats of any kind. Members can also be banned for personal attacks, including name calling and casting aspersions on people personally. Bans are rarely permanent, except for repeated spammers and people who violate our vulgarity or fighting rules. As with any forum, there will always be some editorial decisions around what constitutes a personal attack, etc. The forum administration reserves the sole right to make these determinations. However, anyone can report any post they deem offensive and it will be reviewed by an administrator. Additionally, anyone posting private information that publicly identifies another forum member in any way, shape, or form will be subject to immediate banning at the discretion of the forum administration. Any personal information used in a username or a signature is not considered protected and can be quoted, referenced or mentioned on the forum. Any other personal information, even that available through simple deduction, is not allowed to be posted and may result in an immediate ban. The forum complies with all valid court orders and will release IP address and other identifying information upon receipt of a valid court order directing the disclosure of such. We have a zero tolerance policy for criticism of our moderator team and their moderation techniques. Posting public criticism of a moderator or moderation actions is expressly forbidden and will be deleted and the member will be subject to an immediate ban. This forum is not a democracy, you may always appeal moderation decisions privately with the site owner, but you may not post about it.